Friends always ask us why we visit Malta so often. There are several reasons. It’s easy to get around the island by bus or car (they drive on the left hand side of the road). The climate in January is comfortable although it could have been a little warmer this year. Most people use English so communication isn’t a problem. 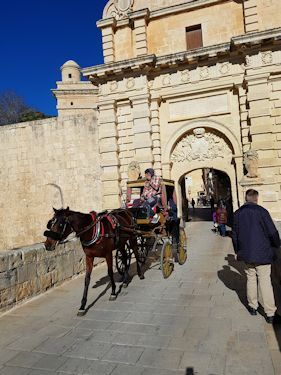 Above all, it’s a beautiful environment and you often have a feeling of being in a time warp from the silent city of Mdina to the bustling hub of Valletta the capital city (European City of Culture 2018) built by the Knights of Malta in the 16th century. Heathrow’s Terminal 4 was a new experience for us. 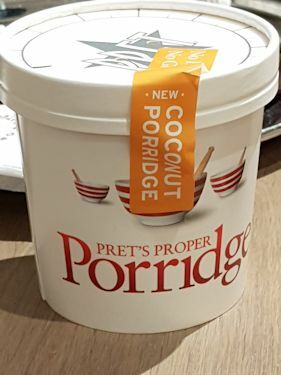 Casual eating places were in short supply but we found Pret https://www.pret.co.uk/en-gb where we had the gluten free, dairy free coconut porridge – delicious and filling accompanied by a cup of English breakfast tea and soya milk. For the flight, we bought a salad for me and a tuna baguette for Ray (crucially it uses mayo instead of butter, although he has to pick out cucumber as he can’t eat it). 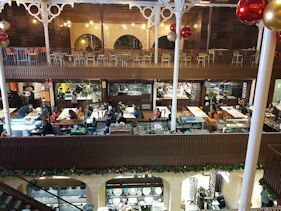 If you have more time, other outlets include Carluccio’s https://www.carluccios.com (which has a gluten free and dairy free menu) as well as the Lebanese Comptoir Libanais https://www.comptoirlibanais.com/ which has gluten free and dairy free choices. There’s also a Costa Coffee https://www.costa.co.uk/ which offer gluten free or dairy free choices such as the vegan and gluten free mince tart, but it’s always unpredictable as to whether they will have it in stock. Once inside the aircraft on Air Malta www.airmalta.com, it was good to see some gluten free and dairy free options in the menu brochure such as Nak’d www.eatnakd.com strawberry and cream nibbles (2.50 euros) – both dairy free and gluten free. Ray’s favourite Eat Real hummus chips www.eatreal.co.uk or Tyrrells sea salted crisps www.tyrrellscrisps.co.uk were on offer. There’s also itsu www.itsu.com satay noodle pot – gluten free rice noodles with a satay flavoured miso based broth and a sachet of dried spring onions. Or there’s Real Olive Co’s www.therealolivecompany.co.uk basil and garlic olives. We were surprised to see a vegan option created by Neil the chef with an article in the brochure on how he created it. The dish is Rosemary Vegetable Focaccia bread with olive spread, grilled vegetables and tomato salsa. 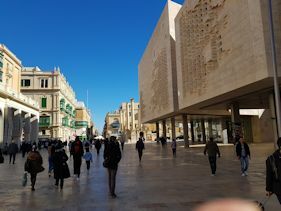 Since Valletta was European City of Culture in 2018, there has been extensive redevelopment and modernisation of areas of the city since our last visit two years ago. For example, the approach to the centre through the city walls has been completely renovated with dramatic bastions. The iconic Triton Fountain has been totally restored to its former glory with the three bronze Tritons holding a huge basin. 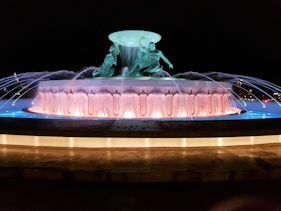 At night, the fountain appears translucent as it is illuminated with coloured lights. Once inside the city, don’t miss Malta’s new parliament building by Renzo Piano, the architect of London’s Shard. On our first night in Malta, we returned to Papanni’s www.papannis.com in Strait Street, which offers gluten free pasta. 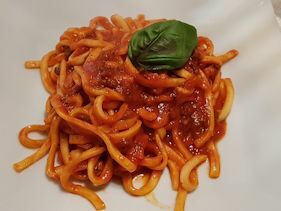 Ray chose Spaghetti Bolognese but it was made with fresh tomatoes. He has a problem with tomato pips so asked if it could be made with passata (sieved tomatoes). After checking with the chef, our waiter confirmed that the dish was dairy free and it could be made with passata. I ordered grilled salmon and salad. We were presented with rice cakes for me, bread for Ray and a tomato dip which we were informed didn’t contain dairy or gluten. Our meal was yummy, which is why this is one of our favourite restaurants. Breakfast at The Grand Excelsior Hotel, www.excelsior.com.mt where we were staying was a vast hot and cold buffet. Hot food included boiled eggs, scrambled eggs, grilled tomatoes (lovely rich flavour), mushrooms and bacon. There was also a station where a chef cooks omelettes in front of you. Ray managed to find out from the staff which cereal was dairy-free. 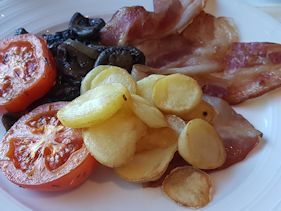 My selection from the buffet included bacon, mushrooms, tomatoes and sautéed potatoes. The impressive array of fruit included melon, pink grapefruit, watermelon, but strangely no bananas unless you asked for them. 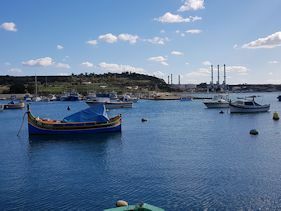 It was a real treat sitting by the window looking at the views of Sliema across the creek and the luxury yachts moored at Msida Marina. Ahead of our stay, I had asked for gluten free bread and soya milk which was provided. 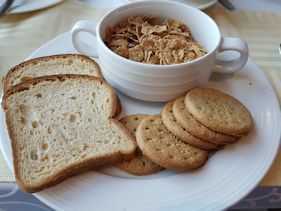 I was presented with a bowl of gluten free cereal, bread and digestive biscuits. Our biggest discovery food-wise in Valletta was the Food Market in Merchant Street www.issuqtalbelt.com which has been open for a year. This is a converted 19th century market hall. 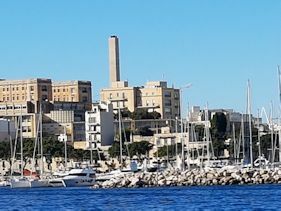 It’s notable for being the first building in Malta to have been built predominantly of iron. Today it’s a vast emporium on three levels. On ground level, there is an array of food stalls offering freshly cooked local produce such as fish, chocolate, kebabs, steak, pizzas, pasta and so on, with an extensive seating area in the middle of the hall. So you can walk round browsing the various vendors until you make your choice. 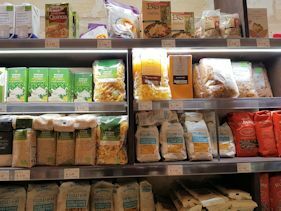 You need to be vigilant, of course, and ask questions about food allergies before making your selection. For example, there is no gluten free pizza or pasta available. 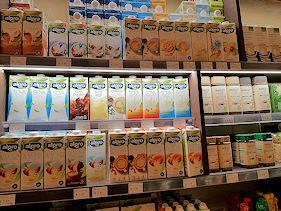 In the basement, you’ll find a supermarket where there’s a host of dairy free milk on sale, as well as other free from options. This is a welcome addition to Valletta, which doesn’t have many food shops. This is open from 7am to 10pm seven days a week. Further seating can be found on the third level. This is also where events are held. Over the weekend, there was a book fair here, selling a wide range of English books at 2.99 euros each including cookery, children’s factual and fiction titles. We were so impressed by the Food Market that we dined there most nights. The stalls are open from 11am to 11pm most evenings, but on Fridays and Saturdays until 12.30am. 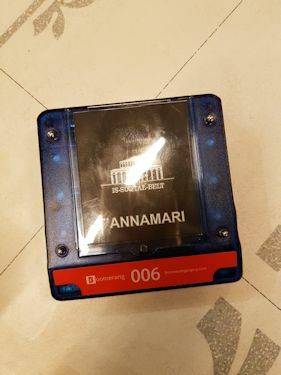 One evening, I ordered salmon and vegetables (17.80 euros) from the T’Anna Mari fish grill and was given a radio alarm to alert me as to when the meal was ready. 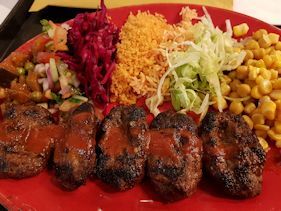 Ray opted for lamb kofte with salad and chips (9.75 euros) from the Konak stand. Both meals were presented on a tray on china plates with real cutlery and serviettes. 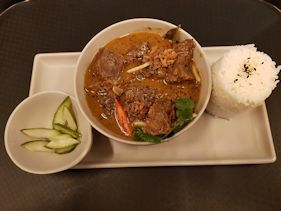 During our stay in Malta, one of our favourite meals was Indonesian Beef Rendang (12 euros) from the Asian Zest stall – succulent pieces of beef cooked in a sumptuous spicy sauce (but not too spicy). Drinks and hot beverages are available from two large bars in the centre of the hall. Sadly there were no dairy free or gluten free cakes on offer but hopefully that may change. 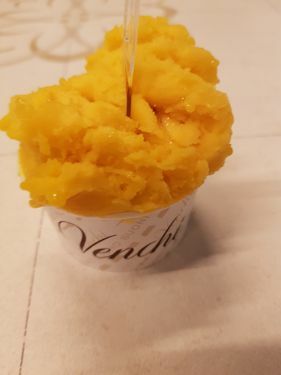 Still we consoled ourselves with a mouth-watering mango sorbet (3.50 euros a cup) from the Venchi stall, which also sells exquisite Italian chocolate. Early Saturday evening when we were dining at the Food Market, the animated movie “Madagascar” was shown on a large central screen. Great for families with young children, although we enjoyed it as well. The advantage of the Food Market is you can eat as much or little as you like. You can see right inside each stall and watch your meal being prepared and cooked. It’s amazing how clean and well equipped some of the kitchens are. We were impressed by the friendly staff who keep the tables clear and customer ready – a difficult job in a busy environment. Trays were cleared away immediately and tablecloths wiped so you could always find a clear, clean table. 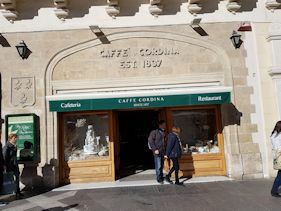 No visit to Valletta is complete without visiting Caffe Cordina www.caffecordina.com dating back to 1837, reminiscent of a Viennese coffee shop. It’s always busy so you just have to be patient to find a seat. We ordered our usual English breakfast tea with soya milk, but the milk curdled (4 euros). Our waiter was so concerned, she brought us fresh tea with more soya milk. Her supervisor also came to check all was well and offered to open a new packet of soya. Happily there was no need as we left the tea for a few minutes before adding the milk. We’ve often find soya milk curdles if it’s added to hot water too quickly. 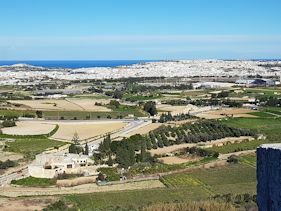 We hired a car for a few days which is a great way to see the island although driving in Malta is challenging due to old road lay-outs and unclear signage. Otherwise the island has excellent bus services with the terminus outside Valletta’s city walls. Fares are 1.50 euros per ride, but there are special offers available, depending on how long you’re staying. 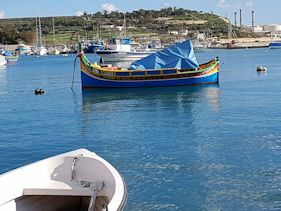 We drove to one of our favourite destinations in Malta – the tranquil fishing village of Marsaxlokk. Avoid Sundays when the tiny village is over-crowded with people visiting the market and you’ll be lucky if you can find anywhere for lunch. Stroll along the harbour and watch the fishermen repairing their boats or folding the nets. A smaller market is there most days selling lace tablecloths, Maltese food and general tourist merchandise. The highlight of the day, apart from sitting in the sunshine, is a fish lunch. 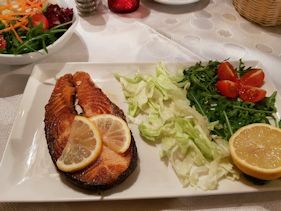 We dined at Ta Mattew https://m.facebook.com/tamattewmarsaxlokk where I enjoyed a smoked salmon salad and Ray had a tuna salad. A vast choice of fresh fish was available including swordfish, as well as other dishes such as octopus and calamari. For a reviving cup of tea (4 euros for two cups) we stopped at Costa Coffee www.costamalta.com just near where the bus drops you off. On another occasion, while out exploring the island, we stopped off at the Radisson Blu Golden Sands resort www.radissonblu.com near Mellieha in Malta. This hotel is so huge, it’s easy to get lost. 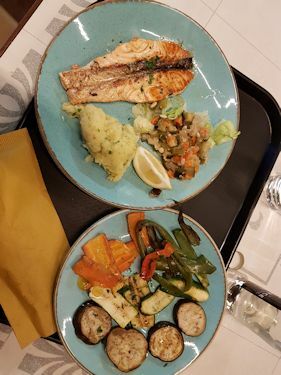 We dined at Agliolio, one of the hotel’s restaurants, which serves pasta, risotto, salads, pizza, fish and meat dishes, but crucially all pasta and pizza is gluten free. The menu carries symbols for vegetarian and vegan, but the only vegan option is tofu salad. 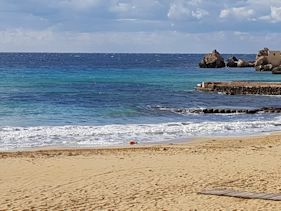 It’s adjacent to the private beach, so as soon as we ordered I went for a stroll, but it was cold with a gusty wind, although there were people sunbathing – in their coats! 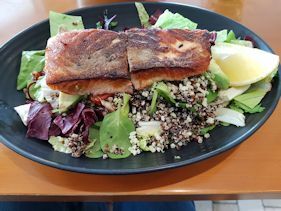 I decided on Insalata Di Salmone – grilled salmon fillet served on quinoa and millet, with avocado, pumpkin seeds and apple puree. Very tasty. 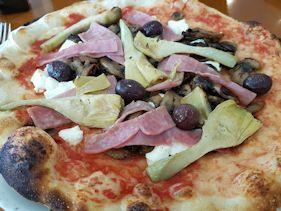 Ray ordered Capisioni pizza with no mozzarella and a topping of onions, mushrooms, artichokes and a thin layer of passata. Don’t miss a visit to Mdina, known as the Silent City, which dates back 4,000 years. It is one of Europe’s finest examples of an ancient walled city with its mix of medieval and baroque architecture. Wander through its narrow streets and discover museums, shops and alleys. 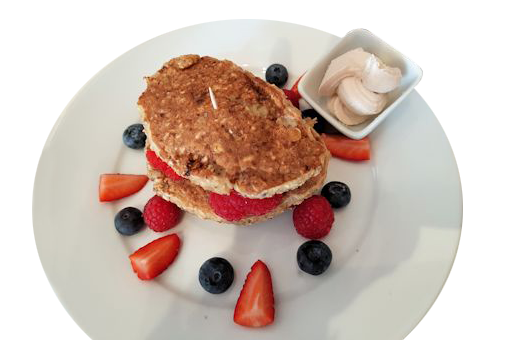 There’s a shortage of places to eat, but we asked at the local newsagents and was directed to Rosmarino https://www.facebook.com/rosmarinobistro/ , a friendly tiny café where the staff went to so much trouble to make sure there was something we could eat. They made a special tuna salad for me, while Ray had the tuna and onion sandwich with no butter. 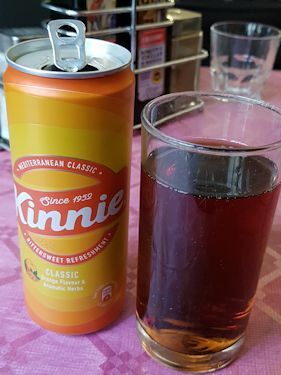 During our trip, he also developed a taste for “Kinnie” www.kinnie.com the Maltese fizzy drink, brewed from bitter oranges and extracts of wormwood. Don’t let that put you off, it has a very refreshing taste. Ray says the taste is similar to Irn-Bru. The bill was 16.85 euros including a mineral water and Kinnie. 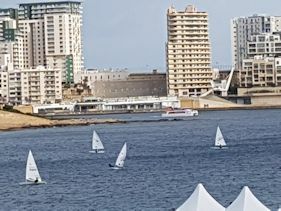 The island hosts many events throughout the year. Coming up on 10th February is the celebration of Malta’s patron saint St Paul and his shipwreck on the island in AD60 and from 28 February to 5 March will be Malta’s annual carnival when people in colourful costumes take to the streets.